Contains around ten of the most powerful antioxidants (resveratrol). Associated with delayed aging (disease prevention, decreased inflammation, reduced mortality). Calorie restriction is the most scientifically-validated way of extending lifespan in all living organisms – it can increase lifespan by almost 100% in certain species. It works by favourably altering gene expression, one of the body’s adaptive responses to reduced calorie intake. In activating certain genes and inhibiting others, calorie restriction significantly slows down the aging process by promoting healthy cell function. 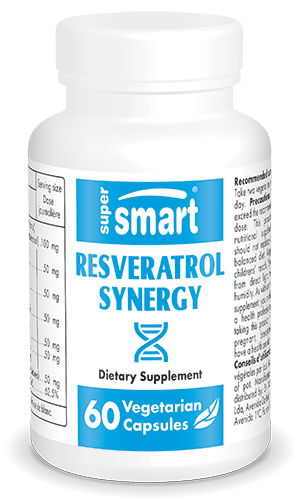 Resveratrol Synergy is an anti-aging supplement formulated from an optimal combination of several antioxidants which work synergistically in the body to exert a protective effect. Antioxidants defend the body from certain types of cell damage, thus slowing down cellular aging. Their effects help prevent the development of certain diseases and complications which may be seriously damaging to health. proanthocyanidins, extracted from pine bark, with antioxidant and anti-inflammatory properties. ﬁsetin, extracted from Buxus sinica, recently added for its stabilising effect on resveratrol. While there are very many powerful antioxidants, we have chosen those with the utmost potency, the efficacy of which has been widely-studied. According to researchers, these multi-beneficial antioxidants have various mechanisms of action. For example, resveratrol, which is included in its bioactive form, appears to act by stimulating mitochondria, the cells’ powerhouses, as well as by blocking certain inflammatory factors. Quercetin, which is recognised for its anti-inflammatory effect, may inhibit the NF-kappaβ pathway, a protein that plays a fundamental role in the inflammatory process. Finally, pterostilbene may offer benefits in regulating the genes involved in the development of atherosclerosis, diabetes, and inflammation. In addition to their antioxidant power, the compounds in Resveratrol Synergy may positively influence fat and carbohydrate metabolism and thus offer another anti-aging effect. In the absence of adequate measures, long term disruption to this metabolism can eventually manifest in metabolic syndrome. This is a collection of symptoms that can foreshadow the development of problems such as cardiovascular disease and type 2 diabetes. Further studies are ongoing to confirm this protective effect which could help prevent premature aging of certain cells. Our anti-aging supplement has been formulated to provide a concentrate of antioxidants, and is offered in vegetarian capsules at a dose of two capsules a day. To fully benefit from their effects, supplements should be taken for at least a month, though this can be adjusted in line with your needs and the advice of your therapist. You may also be interested in other products available in our anti-aging range such as Astragaloside IV. With its combination of nutrients that modulate longevity gene expression, Resveratrol Synergy mimics the effects of calorie restriction, improves biomarkers of aging and boosts disease-fighting mechanisms. Other ingredients : Acacia gum, rice flour. Take two vegetarian capsules a day or as advised by your therapist.